The pink cover of this creative pop up card showcases a colorful laser-cut flower in a blue pot. There is also the text in the meaning of “Best wishes for you” on the flowerpot to signal be a card bringing full of love for everyone to own. Each color of the bouquet is also a mixture of vibrant colors including pink, purple, orange, and blue. 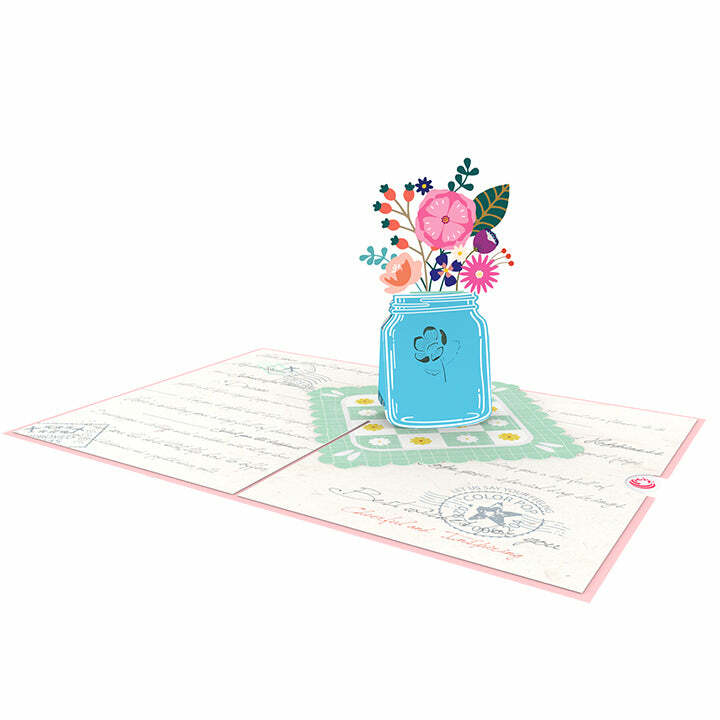 Once opened, the Beautiful Flowers Pop Up Card reveals a gorgeous paper flower bouquet inside a pot. The flowers are surrounded by stylish embellishments. 3D flowers pot is placed on a pretty light green square scarf. The scarf is full of spring flavors when printing yellow and white floral patterns on it. The printed scarf is shown on a style paper that simulated as a sweet greeting space for your loved ones when opening this special greeting card. Flower are universally loved, and who doesn't love to stumble upon a bouquet of flowers. It also becomes a special moment when someone receives a bouquet of flowers. We would like to make it easier for you to share the excitement of a floral bouquet with your loved one any day of the year. And this design brings that feeling indoors by giving us beautiful flowers to display the whole year. Beautiful Flowers Pop Up Card represent love and hope, it also applies to Christmas card, Birthday card, Thank You card and more. You can use the card as a gift to give to someone you really like or love and thanks them for appearing in your life. Because of having paper note inside, it has enough space to add your own unique greeting message, warm with best wishes and love. This is absolutely helpful to express your love every day. The Beautiful Flowers Pop Up Card is 5 x 7 inches.